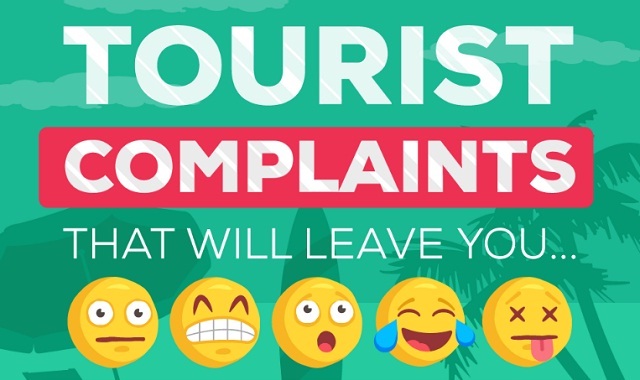 Tourist Complaints That Will Leave You Speechless #infographic ~ Visualistan '+g+"
With the summer season upon us, it’s finally time for sun, barbeques, and most importantly, holidays! For the majority of us, a summer holiday is something to get excited about, for others, it provides a great opportunity to complain. We’ve scoured the Internet to find some of the most outrageous complaints from the fussiest of tourists. From the slightly confused travellers who were unhappy to discover that there were fish in the sea… to the tourists who have been unable to embrace the culture of a new country, complaining that the street signs were in a foreign language and outraged that shops would close during their ‘siesta’ period. Worryingly, these are all real grievances from real tourists, only the names have been changed to spare their blushes. So, if you want to read some of the most bizarre holiday complaints to have ever been made, look no further than the infographic below.